Chocolate Chip Cookies ingredients all assembled! Baking and I don’t get along. Really, I meant it! For me, baking is much harder than cooking. Precision in this form of cooking is paramount. Make a mistake and it will show up in your final product. If you make a decision to do something other than what the recipe specifies, your final product will tell on you. This was my case yesterday when I murdered the chocolate chip cookie. I’m ashamed to show you what I did. However, since we are friends, I figure you won’t laugh at me because friends don’t laugh at another friend’s failed attempt at chocolate chip cookies…right? My wife and kids surely laughed at my cookies. I even laughed with them even if I wanted to bury my head in the sand. I surely had to redeem myself. Gather these ingredients to start your Chewy Chocolate Chip Cookies. My daughter, Kiara, bakes cookies from scratch all the time. 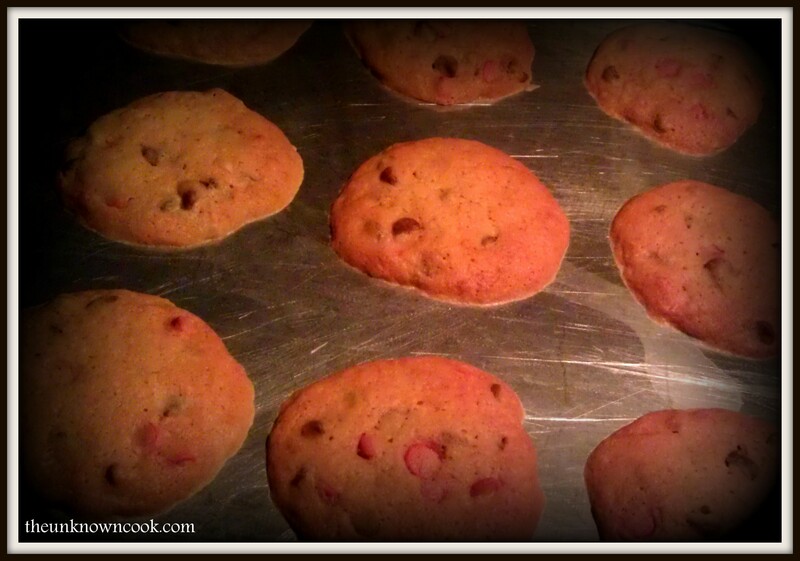 Since she is my offspring, surely I must be able to bake a simple chocolate chip cookie. I mean, who can’t do that? (Why is everyone pointing at me?) Just to make sure I did this right, I channeled Martha Stewart by way of a quick Google search and found her Soft and Chewy Chocolate Chip Cookies recipe. I took my laptop from the dining room table to the kitchen so that I wouldn’t miss a beat. I got all my ingredients assembled and proceeded to follow the directions Ms. Stewart laid out clearly. I noticed in the directions that a paddle was supposed to be used to mix the ingredients together. Well, I didn’t have a paddle so I used the blending tools to mix the ingredients. What could this hurt? 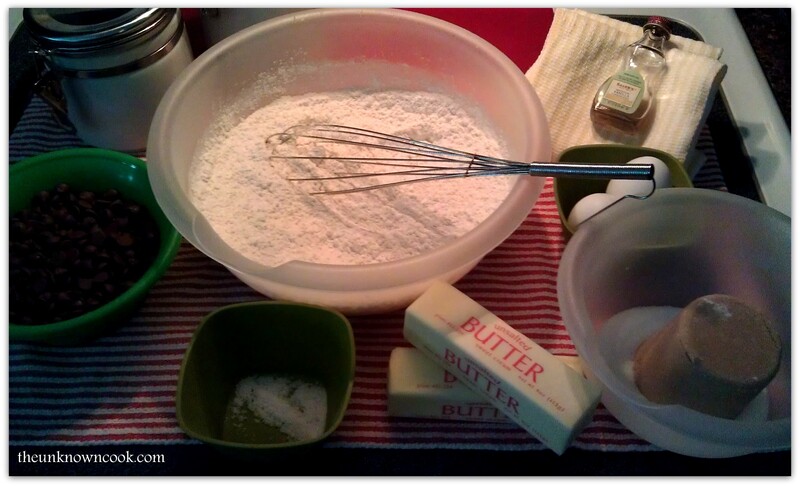 As long as the ingredients are mixed properly, these cookies will come out perfect. If you want your cookies to turn out good, follow these directions word for word! I know what you’re thinking. If The Unknown Cook followed the recipe, why does his cookies look like chocolate chip pancakes? Well, allow me to explain. The directions say to use the paddle attachment which I didn’t have. Because of my propensity to adapt and overcome obstacles, I substituted blending blades. This was surely a case of bad judgement. The blades whipped the ingredients together whereas the paddle would have folded them together. Where is a paddle when I need one! 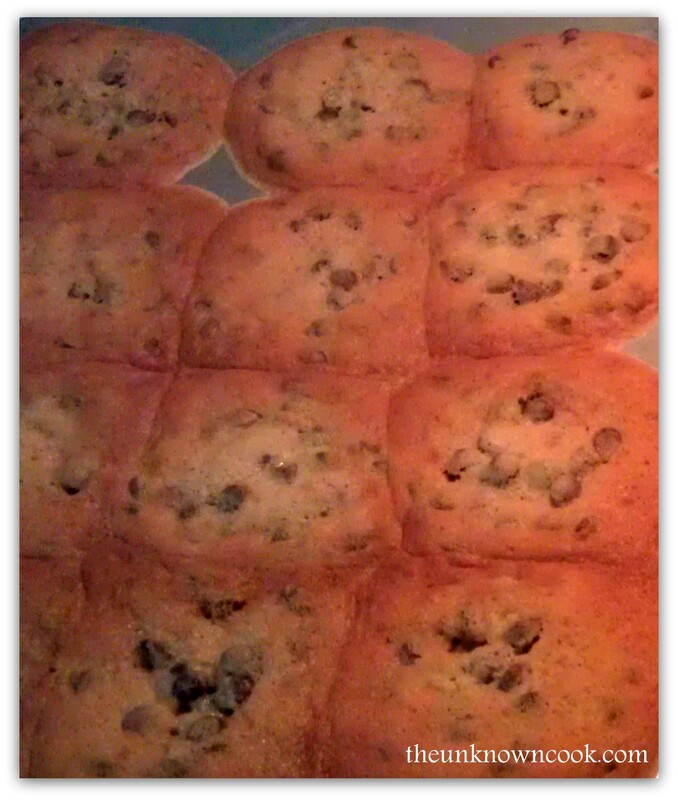 These aren’t what Ms. Stewart’s recipe was supposed to look like! I had awaken Sunday morning with one thing on my mind – Redemption! I had to do these cookies over. I was letting Martha down by putting together a sub-standard batch of cookies. What would she say if she saw these beautiful, but grossly incorrect cookies? I don’t know. All I know is I had to do them over. I still didn’t have a paddle to add to the mixer to blend the ingredients together properly. 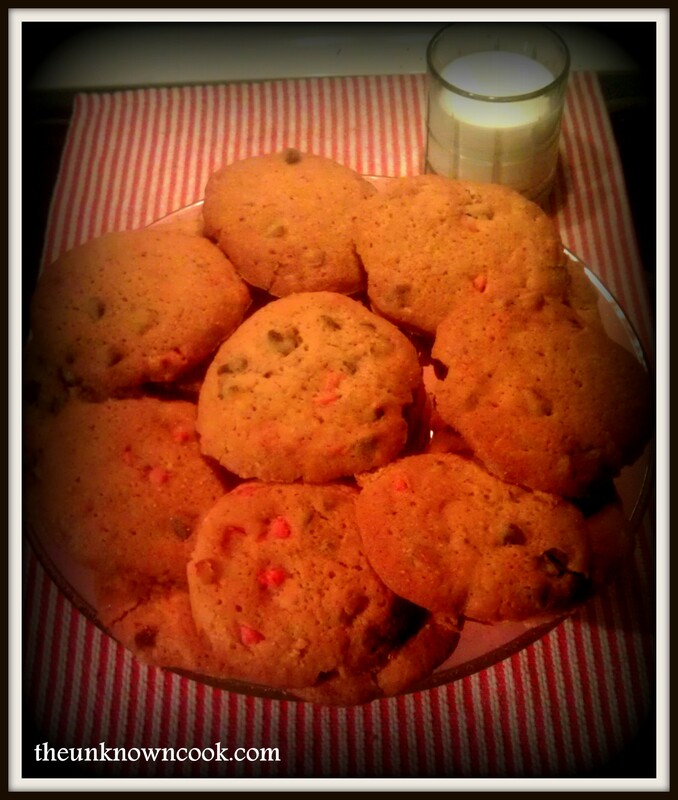 So, I had to use my right arm blender to make these cookies turn out right. Yes, my arm was rather tired. However, this batch of beautiful cookie batter was much better than the last. If you are a person that doesn’t like to bake like me, just remember, FOLLOW THE DIRECTIONS! You’ll be much happier in the end. You don’t want to be known as the cook that murdered the chocolate chip cookies. More than that, you will save yourself from some embarrassing laughter! Strawberry Chocolate Chip Cookies. Soooo Good! Got Milk? These go perfect with a glass! Posted on October 5, 2014, in Uncategorized and tagged best chocolate chip cookie recipe, best chocolate chip cookies, best cookie dessert, best cookie recipe, chocolate chip cookie recipe, chocolate chip cookies, holiday cookie dessert, Martha Stewarts chocolate chip cookies. Bookmark the permalink. Leave a comment.